Selena Gomez is another 20 something singer, actress slash fashion designer that has been making it big in the lime-lite the past couple of years. She became famous as character Alex Russo, in the Emy Award-winning Disney television series the “Wizards of Waverly Place”. She also made her way to the silver screen with performances in a few movies like “Another Cinderella Story” and the “Princess Protection Program” to name a couple. Born in Grand Prarie, Texas back in 1992, this former Disney Channel starlet with both Hispanic and Italian American heritage has also put out a few singles and a couple of albums as she made her way into the pop star limt-lite following other Disney actresses like Miley Cyrus and Britany Spears. 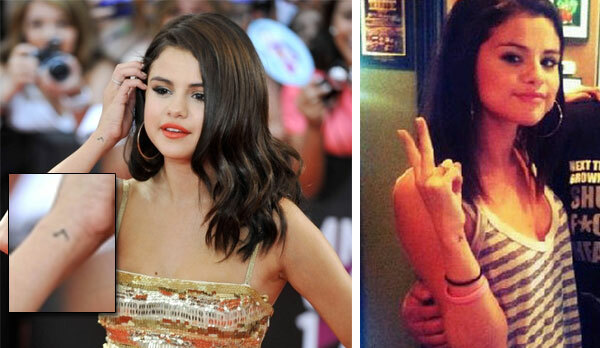 Like those before her, Selena Gomez also has got a little inkwork done to adorn her pop-idol body. Country Singer Taylor Swift has been in the lime-lite the past couple of years with a growing fan base and sellout arena concerts around the US. Not only does she write her own music, but she actually can play an instrument and perform her songs without lip singing or naughty dance moves. Her “girl-next-door” persona is loved by many mothers and their pre-teen daughters who attend her concerts and publicity outings in droves. 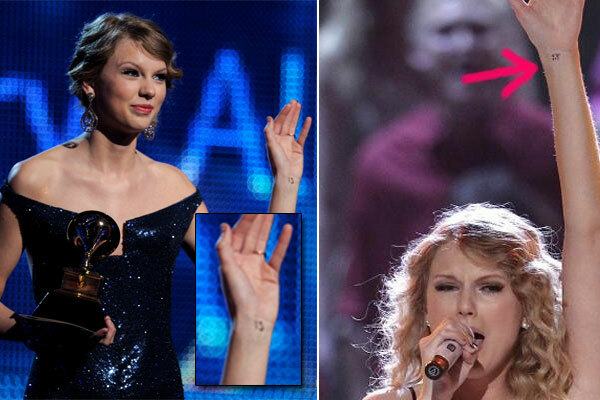 Taylor also has a little ink that she sports under her left wrist and on the top of her foot. Although there is speculation if these are real tattoos or just temporary henna tattoos there is defiantly a meaning or reason behind the artwork that she chooses to adorn on her body. Tattoos are perhaps one of the most personal things that you can get done to your body so haven’t you ever wondered why some people get a particular tattoo. Especially when they are in the lime-lite like an celebrity athlete, rock-star or actor.